Wild Card release date was Friday, January 30, 2015. This was a Limited in theaters release. A compulsive gambler whose addiction has led him to the streets of Vegas, Nick Escalante takes odd jobs providing “security” to support his addiction. His professional and personal lives collide when his friend is brutally beaten forcing him to take on the mob. A remake of the 1986 film. 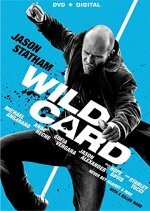 changed the title from "Heat" to "Wild Card"